Lancaster City Hall is located at 120 North Duke Street, Lancaster PA 17608; phone: 717-291-4785. Photo: Old City Hall and Lancaster Farmers' Market–the oldest, continually operating farmers' market in America. June, 2011, from Veteran's Square. The Lancaster City Historic District was listed on the National Register of Historic Places in 2001. Portions of the text, below, were adapted from a copy of the original nomination document. Adaptation copyright © 2010, The Gombach Group. The City of Lancaster is a small city situated near the center of Lancaster County, Pennsylvania. Laid out in a grid pattern, its streets radiate north, south, east and west from the centrally located Penn Square at the intersection of Queen Street and King Street (Pennsylvania Route 462). A natural boundary is formed by the Conestoga Creek to the south and east. The Lancaster City Historic District covers approximately three square miles of the city, and six small portions of Manheim Township. It includes the major thoroughfares of Queen Street and King Street and surrounding streets roughly bounded by Liberty Street to the north, Broad Street to the east, Greenwood Avenue to the south and Race Avenue to the west. Streets are bisected by an extensive system of alleys providing access to the rear of buildings and from street to street. The district contains 14,088 resources. Of the total resources, 13,411 of these are identified as contributing buildings and 606 are non-contributing buildings. There are 9 contributing sites, 6 contributing structures and 14 contributing objects. Of the 13,880 principal buildings, 13,209 are identified as residential, 368 as commercial, 181 as industrial and 122 as institutional. In addition to these contributing resources, the district includes 688 contributing resources in several individual properties and districts previously listed in the National Register. A list of these resources can be found at the end of this section. Previously listed districts include the Lancaster Historic District, as amended, with 539 contributing resources and several smaller tobacco-related industrial districts containing 50 contributing resources. Buildings are brick, frame, stone and log with an average scale of two to three-stories in height and three to five bays in width. While buildings in the district date from the 1760-1950 period of development, the majority of buildings in the district were constructed between 1860 and 1930. The integrity of the district is displayed in its large collection of contributing resources. While there are some intrusions of larger scale later twentieth century buildings, primarily in the central and north central sections of the district, the district maintains an overall cohesive eighteenth, nineteenth, and early twentieth century character. The majority of buildings retain architectural integrity although some have been altered with replacement windows and doors or the removal of ornamental trim. Many commercial buildings have altered storefronts but the majority of these have attained significance in their own right. A small number of residential buildings have original brick walls covered with synthetic materials such as "formstone" or vinyl siding. The predominant architectural styles include Queen Anne, Second Empire, Italianate, Colonial Revival, and restrained Late Victorian vernacular designs. Overall appearance of the district is that of a small city with a central square or hub. Street patterns are regular with one way traffic traveling south on the central streets of Prince and Duke, Shippen and Charlotte while traffic travels one way north on Mulberry, Queen and Lime streets. One way traffic flows east on Chestnut and King streets and west on Walnut and Orange streets. Rail lines cross the northern edge of the district with spur lines entering at the northwest and northeast corners. The northwest, northeast and southeast quadrants of the district have a gentle grade, while the southwest section has a rolling topography. The district contains a central business area, containing predominately three to four story commercial buildings and a few multi-story office buildings, in several blocks surrounding the central square. This area extends from Mifflin Street north to Lemon Street and from Lime Street west to Prince Street. Three blocks on the east side of the central business area are contained in the previously listed Lancaster Historic District. Industrial areas are located primarily in the northwest section around West Liberty Street, along North Prince Street from Liberty to James Street, and in the south along South Prince Street from Hazel Street south. Other areas of scattered industrial activity are found in the primarily residential sections of the southwest along Manor Street and the northeast between New Holland Avenue and East Walnut Street. Residential neighborhoods surround the commercial center and the industrial areas of the district. Areas that are primarily residential include the north-central section, the eastern, southeastern and southwestern sections of the district. Three main public parks are located in the district, Musser Park in the northeast of the central business area, Buchanan Park in the northwest and Reservoir Park in the east in addition, 12 small playground or 'pocket parks" are located in the district. Two squares are located in the district, the central Penn Square at the intersection of King and Queen streets and Lancaster Square, two blocks north of Penn Square, at the intersection of Queen and Chestnut streets. The Soldiers and Sailors Monument, commemorating the death of Lancaster County residents in the Civil War, is located in the center of Penn Square. Other public landscape features include sculptures in Reservoir Park, a fountain in Penn Square and two plazas in Lancaster Square. Five cemeteries are in the district in the northeast, southeast and western areas. Although primarily clustered as previously described, residential, commercial, industrial and institutional buildings are present throughout the district. For residential buildings the scale is generally two to three stories in height and predominately three to five bays in width. Residential and commercial buildings are most often clustered densely within each block and most are set close together on small lots. Most buildings in the district are constructed with little to no setbacks and front directly on the sidewalk. Buildings are usually taller than they are wide, with window and door openings approximately two times as tall as they are wide. Steps, porches or stoops often extend into the public right of way. Building materials are predominately brick but there are a small number of frame and log buildings. Predominant architectural styles reflect those popular in the Victorian period and the early twentieth century, from the 1840's through the 1930's when the greatest amount of building occurred in the district. The Italianate, Romanesque, Second Empire, Gothic Revival, Queen Anne and Colonial Revival styles are reflected in residential, commercial, industrial and institutional buildings. Also present in smaller numbers are the Georgian, Federal, Classical Revival, Renaissance Revival, Beaux Arts, Art Deco and Art Moderne styles. Although less in number, several Georgian style buildings remain in the district. Constructed in 1780, the Michael Musser House, at 323 West King Street, features a pedimented doorway, dentilled cornice, beltcourse and keystones over the windows. Other, Georgian style buildings include the Heritage Center at the central square, the Miller-Yeates Mansion on South Queen Street and the Sehner-Ellicott House at 123 North Prince Street, all listed on the National Register. Federal style buildings are also located in the district. The National Register listed William Montgomery House at 19-21 South Queen Street has an altered first floor but Federal style details can be seen in the cornice, parapeted chimney and oval rooms on the second and third floors. Examples include 105 South Queen Street, the Freeman House and 131 East Chestnut Street a brick dwelling with characteristics of the Federal style in the dormer windows and door surround. Residential buildings are generally two to three stories and three bays wide with asymmetrical facades and moderately-pitched or lateral gable roofs. A smaller number of one-story dwellings constructed of log, frame or brick are found in the district. Rowhouses are the dominant residential building form. Constructed principally of brick and generally three bays in width and two and one-half stories in height, rowhouses in the district feature both plain facades and porches supported by a variety of styles of pillars and posts. The majority of rowhouses date from the 1870-1930 period and have characteristics of the Queen Anne or Italianate styles. A smaller but still significant number of rowhouses date from the early twentieth century and are constructed in or feature characteristics of the Colonial Revival style. A small percentage of contributing residential buildings have been covered with synthetic siding materials including "formstone," vinyl and aluminum siding. Although in some cases ornamental woodwork has been removed or covered with synthetic materials, these buildings continue to retain integrity in their simplified form. Several Italianate style mansions are located in the district including the John R. Bitner Mansion at 416 North Duke Street and the John S.Rohrer Mansion at 402 North Queen Street. The Rohrer Mansion, constructed for a founder of the Fuiton Bank, is a symmetrical Italianate building with decorative window hoods, wide eaves with brackets and a cupola. The district contains many rowhouses that are good examples of this style, with tall narrow, often arched windows, heavily bracketed cornices and low-pitched or flat roofs. Another popular style is the Queen Anne style with multiple gable roofs, towers, turrets and textured wall surfaces. Characteristics of the style are found on many more buildings especially simple rowhouses. Examples of the Queen Anne style in rowhouses include those found in the 600 block of East King Street. These buildings feature bays on the second story, ornamented dormers, swags and pressed brick ornamentation. Many rowhouses in the district reflect a restrained interpretation of Italianate and other Victorian styles. The buildings on the 600 block of West Lemon Street illustrate the popular vernacular interpretation with three bays, two and one-half stories, segmental arched window openings, semi-circular transom over the door and gable dormer window in the side-facing, moderate pitch gable roof. Buildings with elements of all the popular late-nineteenth century styles are present in the district. Single dwellings also display a variety of popular late-nineteenth century styles including Second Empire style. Illustrating this style are 439 North Duke Street, 442 and 444 South Queen Street with projecting central pavilion, arched window openings with hood molds and mansard roof. The Second Empire influence is also seen in rowhouse designs with many rowhouses displaying mansard roofs and wall dormers. The most prevalent single architectural style in the district is Colonial Revival with 3,251 buildings illustrating characteristics of the style. The large number of buildings in the Colonial Revival style show the popularity of the style in the district and the large amount of building that occurred in the late nineteenth and early twentieth centuries. Residential areas of the northeast and northwest portions of the district contain a large number of rowhouses and duplexes with the classical ornament, paired windows and porches supported by classical columns typical of this style. Commercial buildings are usually three stories in height and constructed of brick with flat, low pitched or lateral gable roofs. A few buildings are four to five stories high. Most commercial buildings are three to five bays in width. Many combine residential and commercial uses with an altered first floor storefront and intact upper residential floors. Some commercial buildings have twentieth century synthetic materials covering the first floor facade. The majority of these buildings were constructed in the 1850-1930 period with a few late eighteenth and early-mid nineteenth century commercial buildings present in the district. Architectural styles present in commercial buildings in the district include Italianate, Renaissance Revival, Queen Anne, Beaux Arts, Georgian Revival, Art Deco and Commercial Style. The National Register listed Greist Building, a multi-story "skyscraper" constructed in 1925, is located in the district. In addition to stores and banks the district contains markethouses including Western Market and' Fulton Market. Italianate and Queen Anne elements are present on many commercial buildings in the district. Commercial buildings on North Prince and King streets display a variety of characteristics including projecting cornices with paired brackets, arched window openings with hood molds and mansard roofs. The Miller and Hartman Building at 23 West Chestnut Street is a cast iron storefront with Queen Anne style details. The National Register listed Southern Market is another example of this style with detailed pressed brick on the eastern facade. The Art Deco style is present in the Shaub Shoe Store at 20 North Queen Street. This concrete building features sculptural ornament at the cornice, bronzed metal enframing the second floor windows and an octagonal hanging lamp. The National Register listed Lancaster Newspapers, Inc building at 8 West King Street is another example of the Art Deco style. Another typical form of commercial building is the neighborhood store or tavern most commonly found on street corners. These are often converted residential buildings or buildings constructed for a dual residential/commercial purpose. Displaying a range of popular late-nineteenth and early twentieth century styles these commercial buildings are located throughout the district. Industrial buildings, while located throughout the district, are mainly concentrated in the areas where railroad lines historically bisected the city. A majority of these are three to five story warehouse and factory buildings. The district includes a large concentration of tobacco warehouses and a smaller number of other industrial buildings from the cork, candy, brewing, umbrella and clock industries. The district's tobacco related resources are part of a multiple property nomination, completed in 1990, that includes 64 buildings. Industrial buildings are predominantly brick and three to five stories in height. The National Register listed Conestoga Steam Cotton Works, in the 200 block of South Prince Street, is a complex of brick factory buildings, constructed between 1845 and 1910. These buildings include Mill #2, a Romanesque Revival three-story building. Although industrial buildings are located throughout the district a large percentage are concentrated in the northwest section of the district including a large complex of cork manufacturing buildings. The General Cigar Company building, at 449 S. Lime Street, is an example of the utilitarian design of most industrial buildings. The majority of industrial resources date from the 1880-1930 period. The Posey Iron Works office building at 560 South Prince Street is an example of the popular Neo-Classical Revival style. Architectural styles are generally vernacular interpretations of popular revival styles including Queen Anne, Classical Revival and other more utilitarian designs. Institutional buildings include churches, schools and government buildings and are located throughout the district. These are usually two to three stories in height and constructed of brick or stone. Government buildings include the City Hall building on North Duke Street, 1891-1 892 and portions of the Lancaster County Prison, 1851. Architectural styles for these institutional buildings include Beaux Arts, Roman Revival and Norman Revival styles. Religious buildings reflect the district's period of significance and the architectural preferences of the residents. The district includes St. Mary's Catholic Church, constructed in 1852-1867, Temple Shaarai Shamoyim, 1895-1896 and Bethel A.M.E. Church, circa 1880. Dominant characteristics include brick as the building material and front-facing gable orientation of the design. Gothic Revival and Romanesque Revival are the most predominant styles for these religious buildings. Many educational buildings are located in the district. These include college, high school and grade school buildings. Constructed mostly in the late 1800's and early 1900's educational buildings in the district are generally two to three story, brick buildings. Predominant architectural styles include Gothic Revival, Georgian Revival and Colonial Revival designs. The Thaddeus Stevens Trade School building, now part of the Thaddeus Stevens College of Technology, at 750 East King Street shows the popularity of revival styles even into the early twentieth century. The only transportation related building remaining in the district is the Pennsylvania Railroad Station on McGovern Avenue, constructed in 1929, in the Classical Revival style. Several cemeteries are located in the district. These include the Lancaster Cemetery and St. Mary's Cemetery in the northeast section of the district. These adjacent cemeteries are surrounded by a late nineteenth century cast iron fence, The Lancaster Cemetery is constructed with winding paths around curving sections containing a large number of late nineteenth and early twentieth century markers and monuments. The Concord-Shreiner Cemetery on West Chestnut Street is a small mid-nineteenth century graveyard surrounded by a cast iron fence and containing markers and monuments laid in a regular pattern. The Woodward Hill, Zion Lutheran and Greenwood cemeteries are in the southeast area of the district. Woodward Hill features curving paths, covers approximately thirty-two acres on a rolling hillside, and contains a brick, Gothic style chapel building. Zion Lutheran Cemetery is located at the northern edge of Woodward Hill. Greenwood Cemetery is located to the south of Woodward Hill Cemetery across Chesapeake Street. The National Register listed Lancaster Crematorium is located in Greenwood Cemetery. Contributing resources in the district reflect the City of Lancaster's growth over the period from 1760-1950. With 13,440 contributing resources and 648 non-contributing resources, the district has historical and architectural integrity. The district displays an overall cohesiveness, with blocks of nineteenth century resources not adversely effected by the few intrusions of late twentieth century buildings, some of which may be considered contributing resources in the future. Non-contributing resources in the district include those constructed after the period of significance, as well as some resources constructed before 1950. Non-contributing resources constructed before 1950 are classified as non-contributing because extensive alterations have irreparably altered the integrity of the resource. For example, a residential building could be considered non-contributing if the building has had a large amount of historic materials permanently altered or removed in such a way as to obscure the original form, shape and design of the building. Non-contributing resources are 3% of the total number in the district. The majority of these are mid-twentieth century residential and commercial buildings constructed as part of the Urban Renewal program. The largest concentration of non-contributing buildings is around the intersection of Queen and Chestnut streets. In the late 1960's much of the two blocks bounded by North Prince and North Duke, Orange and Chestnut streets was razed and replaced with a modern office building, hotel, department store, plaza and parking garages. With a total of 96% contributing resources, the district clearly conveys its historical and architectural integrity. The City of Lancaster Historic District ... [is significant] ... in industry, commerce, community planning and development and politics/government and or significance in architecture. Commerce and industry developed the area into a thriving city from the 1860's to the present. The architectural significance of the district lies in its many residential, commercial, industrial and institutional buildings that reflect the development of the city and the regionally popular styles and types of architecture in the period from 1760-1950. This period is significant because it encompasses the district's greatest period of growth as an industrial, commercial and governmental center in Lancaster County. This nomination primarily discusses these criteria as they apply to the district as a whole. In addition to these areas of significance other areas of significance are reflected in the district's previously listed individual properties and districts. Additional areas of significance contributed by these resources ... include, education, philosophy, engineering, law, agriculture, social history, communications, entertainment, invention, art and military history and are discussed in the subsection "Other Areas of Significance." Lancaster was incorporated as a borough in 1742. As the eighteenth century progressed, the area encompassed by the district continued to grow. The area called Mussertown, to the southeast of Hamilton's land, was laid out by owner John Musser in 1760-1762 and was a major addition, mostly developed by 1824. For thirteen years, from 1799 to 1812, Lancaster was the capital of Pennsylvania. The City was incorporated in 1818. Because King Street was part of the Old Philadelphia Pike leading to Wright's Ferry, and routes to Maryland and northern Pennsylvania also came through the City, the area became a stop for travelers and settlers. Commerce increased as Lancaster became, for about forty years, the largest inland town in America. The first paved road in America, the Lancaster and Philadelphia Turnpike, also enhanced commerce in the district. However, by the early 1800's Lancaster had lost some of its commercial importance. The further settlement of Pennsylvania had increased trade in other areas of the state and impacted commerce in the district. Because King Street was part of the Old Philadelphia Pike leading to Wright's Industry began to grow in the district with the arrival of the railroad in 1834. From the mid to the late- nineteenth century industries flourished in the district and the population grew. Between 1830 and 1860 the population of the city had grown from 7,704 to 17,603. Industries that flourished included cloth mills, cork, production of umbrellas. Other industries from the late-nineteenth to the early twentieth centuries include brewing, candy, carriages and wagons, architectural and ornamental ironwork, and watches. Because King Street was part of the Old Philadelphia Pike leading to Wright's With the increases in industry came an increase in commerce. Retailing, concentrated in the center of the district, grew with the increase of population and the results of the industrial revolution. In the 1870's the Woolworth five and ten cent store was founded by Frank W. Woolworth on North Queen Street. Department stores such as Hager's, Garvin's and Watt and Shand's flourished in the central business areas on King and Queen streets. Banks and office buildings were also constructed in this part of the district. As the County seat, Lancaster was also the site of government buildings such as the County Courthouse and the Lancaster County Prison on East King Street and the Post Office building on North Duke Street. Schools, theatres and churches were constructed as the economy prospered through the late 1800's and into the early 1900's. As industry and commerce transformed areas of the district, the demand for residential housing increased. Existing, predominantly one-story, residential buildings were replaced by new brick rowhouses and duplexes designed to meet the needs of factory and mill workers. Larger single residences for wealthier families were constructed in the north-central part of the district. Around the central business district and the areas of industrial buildings, residential buildings, predominantly rowhouses, filled the remaining undeveloped areas. Although development occurred in an outward movement from the center, there are few clearly definable neighborhoods. One of these is Cabbage Hill, an area of development in the southwest part of the district. Consisting mostly of late nineteenth century rowhouses this area is also geographically distinctive with long blocks of residences ascending the side of a hill. Another example, the northeast portion of the district, was developed with rowhouses and a markethouse in the early twentieth century. This growth of various neighborhoods continued through the first third of the twentieth century as industry remained strong. The end of World War II provided a turning point in the history of the district. Post-war suburbanization, aided by federally funded mortgages and housing developments for veterans and investments in infrastructure resulted in a gradual migration of commercial activities to the outlying areas of Lancaster County. In the 1960's and 1970's, urban renewal programs had some effect on the district as several blocks of North Queen Street were razed and replaced with large office, hotel and parking garage buildings. Portions of South Duke Street were also razed under these programs. Although the industrial boom of the late-nineteenth and early twentieth century ended and several important mills and factories closed or moved to different locations, the district still maintained several important industries into the second half of the twentieth century. These included Armstrong Corporation in the northwest part of the district and the Hamilton Watch Company. Although some new construction occurred in the district, the late twentieth century was a period of gradual loss of commercial and industrial activity in the district. With the closure of the last downtown department store in the early 1990's, commercial activity in the center of the district declined significantly. Conversions of residential property from owner occupied to rental housing increased through the last two decades of the 1900's. At the present time, the district continues to experience the effects of the movement of commercial and industrial activity to the outlying suburban areas. The district remains a center for local government with the Lancaster County courthouse and other offices for local County government. The proposed conversion of the National Register listed Watt and Shand Department Store building to a hotel and the construction of a new convention center are scheduled to take place in the next two to three years. The Lancaster City Historic District is significant as an example of the importance of industry to the growth of cities in Pennsylvania. The district is significant as the largest industrial center in Lancaster County from the 1870's through the 1920's. Although other Lancaster County communities benefited from industrial development, the Lancaster City Historic District area developed more industries and grew more rapidly. Prior to the arrival of the railroad in 1834, the growth of Lancaster was modest. Because Lancaster did not have any waterways navigable by large ships, distribution of manufactured goods on a large scale was not practical until after rail transportation was available. The arrival of the railroad enabled goods produced locally to reach a wider market. After the 1830's, industry became one of the main forces driving the development of the district. In 1847 the Conestoga Steam Cotton Works began what was to become by 1860 one of the district's most important industries. The National Register listed Steam Cotton Works buildings are located in the district on South Prince Street. Not only of local significance, these mills produced more than 80% of the canvas and other cloth used by the Union army during the Civil War. By the 1880's the Steam Cotton Works employed more workers in the district than any other industry. Other boroughs and towns in Lancaster County also developed as areas of industry in the last half of the nineteenth century. Like the City of Lancaster, the communities of Columbia, Manheim and Mount Joy grew with the development of a variety of industries. The Bridgens Atlas of Lancaster County of 1864 shows the Lancaster City Historic District containing several industries: the Conestoga Steam Cotton Works, a gas works, locomotive works, foundries and a leather factory. The atlas also shows the industries of other Lancaster County towns including Columbia, with a gas works, planing mill, rolling mill and water works; Manheim with planing mills; and Mount Joy, with three foundries and a railroad car factory. By 1875 the area encompassed by the district was a thriving center of manufacturing that surpassed the other Lancaster County communities. The 1875 Historical Atlas of Lancaster County Pennsylvania illustrates an increase in industrial buildings, especially in the central and northern parts of the district. The Conestoga Steam Cotton Works complex doubled in size. In contrast, Columbia and Mount Joy, while adding some additional industries, experienced far less growth. Lancaster City Historic District Section number 8 Page 4 Lancaster County, PA The census of 1880 also shows the importance of tobacco related industry in the historic district. With an abundant supply of locally grown tobacco, cigar production and tobacco warehousing became important components of local industry. With a value of $230,000 the production of cigars, cigarettes and other tobacco products was significant at this time. Manheim Borough and other Lancaster County communities also boasted tobacco related industries but none matched the volume of production found in the Lancaster City Historic District. The high concentration of tobacco warehouses and manufacturing buildings in the district illustrate the significance of the industry, an industry that continued to flourish throughout the late nineteenth and early twentieth centuries. The warehouses at 717 and 723 North Prince Street and the General Cigar Company building at 449 South Lime Street, are typical of tobacco related buildings in the district. Many of the existing tobacco related buildings in the district are individually listed on the National Register or are included in the North Prince Street Historic District, the North Charlotte Street Historic District, The Harrisburg Avenue Tobacco Historic District, the Eisenlohr-Bayuk Tobacco Historic District, the North Shippen-Tobacco Avenue Historic District, the Teller Brothers- Reed Tobacco Historic District, or the "Tobacco Buildings of Lancaster City" Multiple Property listing. The late nineteenth to early twentieth century period saw growth in other industries. Confectionery production played a significant role in the district at this time. As noted in the Tenth Census, seven establishments employed 46 workers and produced $67,000 of goods in the district in 1880. By 1990, census records showed 25 confectionery producers, employing 71 2 workers and producing goods valued at $885,446 were operating in the district. Examples of confectionery manufacturing buildings include the Frantz Candy Factory, part of the National Register listed Lancaster Historic District, located at 131-135 East Grant Street. The cork industry was also important in the district. Begun in 1860, the Conestoga Cork Works was joined by the Lancaster Cork Works in 1875. By 1883 cork production had also become a significant industry. The National Register listed Conestoga Cork Works building is located at 215-235 East Fulton Street. The 1895 merger of the Conestoga Cork Works and Lancaster Cork Works with Pittsburg's Armstrong Brothers Company in 1895 created the Armstrong Cork Company. Later converted to a floor covering and insulation manufacturer, the Armstrong Company's early twentieth century complex of buildings is located at 313 West Liberty Street. The Census of 1880 also showed the importance of iron foundries in the district. At that time, foundries in the district produced goods valued at $1 84,000 and employed 171 workers. By 1900 foundry and machine shop products were valued at $362,694 and employing 232 workers. Ironwork continued to be an important industry in the district in the early twentieth century. The Posey Ironworks, 560 South Prince Street flourished in the early years of the twentieth century supplying iron parts for military and naval applications in World War I and II. Other major late-nineteenth and early twentieth century industries added to the prosperity of the district. Industries such as watch and clock production, carriage and wagon works, and soap-making employed workers throughout the district. With the strong and rapid growth of industry, Lancaster City prospered. High rates of employment led to increased demands for residential housing and commercial goods. With its large number of industrial buildings, the Lancaster City Historic District illustrates the development of the primary center of industry in Lancaster County. Listed as one of the 100 principal manufacturing cities in the United States Census of 1880, 1890 and 1900, the district is significant as a center for industry in the late nineteenth and early twentieth centuries. The district, with its large number of commercial buildings, is significant as the largest commercial area of Lancaster County. From its beginnings as an inland town in the 1700's, the district was an important commercial hub for farmers in the county and travelers through the region. With the growth of retailing, banking, entertainment and education outlets throughout the nineteenth and early twentieth centuries, Lancaster became the commercial center of the county. The central business area of the district, within several blocks of the central square, developed from a mixed residential and commercial area in the late 1700's to an area of three-story brick commercial buildings by the 1870's. Like the communities of Manheim and Columbia, the district's greatest period of commercial growth was in the mid-late nineteenth century. Like the Manheim Borough, the district's commercial growth is correlated to the arrival of the railroad and the growth of industry. But, compared to other towns in the county, the Lancaster City Historic District developed the largest commercial area. Set in the center of a rich agricultural region, Lancaster's central square has been the site of farmer's markets for about 250 years. As the prosperity of the mid-late 1800's continued, markets were constructed in various areas of the district, including the National Register listed buildings: Southern Market on South Queen Street, Eastern Market on East King Street and the Central Market at Penn Square. The growth of retailing is one of the most significant aspects of commerce to the district. Stores flourished in the central blocks of Queen and King streets including the development of several large department stores. In addition to the founding of Woolworth's in the 1870's, the establishment of the Watt and Shand Department Store in the late 1800's and the Hager Department Store in the early 1900's helped to make Lancaster an even more important commercial center. Newspaper production was also a commercial endeavor in the district. The New Era Printing Company, once located in the building at 39-41 North Queen Street, evolved into other publishing businesses. Banking played a part in the development of the district. With the growth of the area, banks constructed several buildings in the district including the Lancaster Trust building at 37-41 North Market Street. Banking still continues to play a prominent role in the local economy with the largest concentration of banks in Lancaster County located in the central business district. The district is significant in the area of community planning and development. From the initial Hamilton street plan of the City with a central community space, Penn Square, at the intersection of principal roads, to the decentralization of urban functions by the advent of the automobile, the district illustrates the effects of community planning. As detailed in David Schuyter's "The Evolution of Center City Lancaster," the district's development reflects some of the same changes of form as larger metropolitan areas in the same time period. The district illustrates how community planning ideas guided the development of a small city. After the initial period of development as a commercial and governmental center in the late eighteenth and early nineteenth centuries waned with the moving of the capital to Harrisburg, district residents began to plan development for economic recovery and stability. These early planning attempts continued and became more important as the nineteenth century progressed. Like other cities, Lancaster planned for the economic revitalization of the city in the 1830's and 1840's by the promotion of centrally located transportation technology and industry. In 1837, a publicly owned pumping station provided a reliable source of clean water for city residents. Merchants and civic leaders recognized the importance of having important public buildings in the city and planned for them. Planning for the public interest determined the location of the new County Courthouse less than a block from the central square. Community planning concerns in the mid-1800's guided the placement of other public buildings such as the Lancaster County Prison building at the eastern end of King Street, removed from central residential neighborhoods and in a rural area thought to be more conducive to reform. The importance of planning to maintain social order also resulted in the creation of a municipal police force in 1867. The importance of memorializing historic events for the education and affirmation of the public led to the construction of the Soldiers and Sailors Monument in 1874. The transportation innovation of the streetcar in the 1870-1890 period and the introduction of telephone service and electrical power in the 1880's allowed the formerly centralized residential areas to move to the outer edges of the district. The streetcar also allowed people from everywhere in the county to easily visit, shop, and work in the center city without having to live there. This trend was accelerated by the introduction of the automobile. The impact of the automobile directed community planning in the district in the early twentieth century and in 1929 Lancaster's business and civic leaders commissioned John Nolen to create a comprehensive plan for development. Nolen's plan suggested widening streets to accommodate automobile traffic and extending the roads into undeveloped areas around the city. The decentralization caused by planning for the automobile continued through the period of World War II. By the 1950's and 1960' s the renewal of building stock in the district was seen as an important problem and city planning innovations impacted the district through "urban renewal" demolitions and new construction in the central business area. The City of Lancaster Historic District is also significant in the area of architecture. Buildings in the district illustrate differences of style, scale and building materials of the most popular architectural styles from the period of significance, 1760-1950. These buildings include those from the eighteenth and early nineteenth centuries and illustrate both high style and vernacular types. With a large concentration of buildings from the late nineteenth to early twentieth century the district is a significant example of architectural styles of that period. Although other Lancaster County communities contain buildings from the eighteenth, nineteenth and twentieth centuries, the district contains a significantly larger number of buildings from the entire period. The district is significant for the large number and variety of Victorian styles illustrated in over 1 0,300 residential, industrial and commercial buildings. Styles represented in the district include Italianate, Queen Anne, Second Empire, and Gothic Revival in both high style and simplified interpretations. While the boroughs of Columbia, Manheim and Mount Joy contain buildings of these styles, the district contains a larger number of buildings constructed in these Victorian styles than any other Lancaster County community. Also significant is the large number of Colonial Revival style buildings in the district. With 3,251 buildings illustrating characteristics of the style, the district contains a larger number of Colonial Revival style buildings than other Lancaster County communities. Several notable architects designed buildings in the district. Nationally known architect, Samuel Sloan designed the National Register listed Fulton Opera House on North Prince Street. Stephen Hills, who designed the capitol in Jefferson City, Missouri and the first capital building in Harrisburg, Pennsylvania designed the National Register listed William Montgomery House on South Queen Street. The work of locally prominent architects is also significant in the district. Many buildings in the central business district are the work of C. Ernlen Urban. Among these are the Watt and Shand building, Southern Market and the Greist Building at 8 North Queen Street, the only skyscraper in the district, all listed on the National Register. The Art Deco style Shaub Shoe Store, at 18 North Queen Street, was designed by local architect Henry Shaub. With many and varied examples of the popular architectural styles of the period of significance, the Lancaster City Historic District illustrates the development of architecture in a small Pennsylvania city. As in the district, many communities in Lancaster County were founded in the eighteenth century and twentieth centuries, the district presents a valuable collection of building types and styles from the entire period of significance. The large concentration of buildings from the district's greatest period of growth, 1850-1940, significantly illustrates popular late nineteenth and early twentieth century urban architecture. With over 13,800 buildings from this period, the district represents the largest collection of buildings from this period in any Lancaster County community. As the county seat for Lancaster County, Pennsylvania, the district is significant for its governmental resources including courthouse, post office, city hall and prison buildings. The National Register listed Lancaster County Courthouse building is located in the district at 50 North Duke Street. 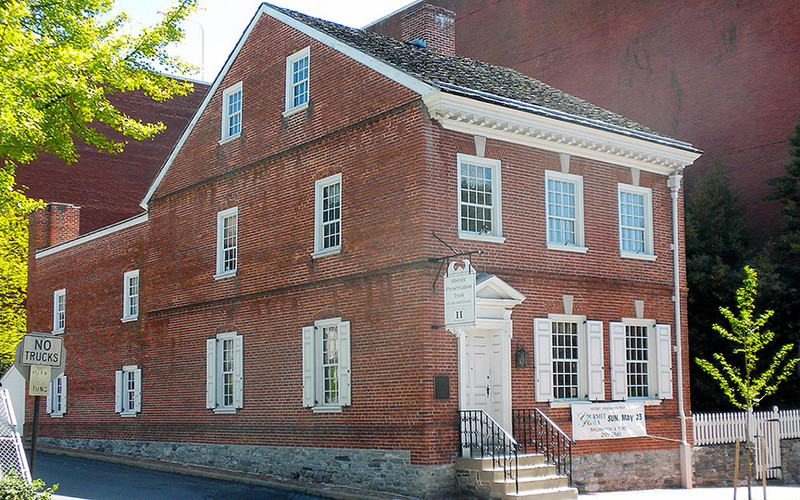 This building was designed by nationally known architect Samuel Sloan in 1852 and has been in continuous use as a courthouse since that The National Register listed Old City Hall building, located in Penn Square, was constructed in 1795-1797 and used as state offices around 1800 to 1812 before becoming City Hall from 1854 to 1930. Other government buildings in the district include the present City Hall at 120 North Duke Street. Designed as a post office by Will A. Freret in the Venetian Renaissance style, this building was constructed 1891- 1892. When a new post office was constructed in 1931 at 48 West Chestnut Street, the old building was remodeled as the Municipal Building/City Hall. The oldest portion of the Lancaster County Prison, designed in 1851 by nationally known prison architect John Haviland, is located at 625 East King Street. Several additional areas of significance are contributed to the district by the following individually National Register listed or eligible resources. Tobacco resources, located throughout the district and included in the "Tobacco Buildings of Lancaster City" multiple property nomination are significant for agriculture for their relationship with the surrounding Lancaster County agricultural economy. Demuth, H.C. Cigar and Snuff Factory, 114-1 16 East King Street, is significant for art for its association with noted modern artist Charles Demuth. The New Era Building, 39-41 North Queen Street, is significant for communications as the location of the New Era Printing Company, printer of periodicals, journals and books with national circulation, including Illustrated Flora of the Northern United States and Canada,one of the earliest illustrated flora books in the United States. Steven's High School, northeast corner of West Chestnut and Charlotte streets, is significant for education as the first public girls' high school in Lancaster County that offered ad the major educational facilities available to boys. Old Main, Diagnothean Hall and Goethean Hall, Franklin and Marshall College Campus, are significant in the areas of education and philosophy. These are original buildings of Franklin and Marshall College an institution originating as Franklin College, the oldest inland college in the United States and Marshall College, one of the first colleges to combine German philosophical idealism with American humanitarian enlightenment. Fulton Opera House, 12-14 North Prince Street, is significant for performing arts as "one of the finest small town theaters on the circuit of professional touring companies" from 1852-1930. Lancaster Watch Company/Hamilton Watch is significant for invention as the developer of accurate watches for railroad conductors and inspectors, the production of chronometers in World War I and II, and the introduction of the world's first electric wrist watch. The National Register listed Jasper Yeates House, 24 South Queen Street, is significant as the home and law office of Jasper Yeates, chairman of the Committee of Correspondence for Lancaster County in 1776. Mr. Yeates was also a delegate to the Pennsylvania Convention for the ratification of the United States Constitution in 1787, commissioner for negotiating the end of the Whiskey Insurrection in 1794, and Justice of the Supreme Court of Pennsylvania from 1791 to 1817. Soldiers and Sailors Monument, located in Penn Square is significant for its commemoration of Lancaster County's contribution to military service in the Civil War. The Lancaster Armory, 438 North Queen Street, has military significance as part of the multiple property nomination: Pennsylvania National Guard Armories. Lancaster Crematorium, located in the district in Greenwood Cemetery, is significant in the area of social history as the crematorium for the Lancaster Cremation and Funeral Reform Society, the first public cremation society in the United States offering to serve anyone regardless of geographic location. The Hamilton Apartments, 247-249 North Duke Street and 104-118 East Walnut Street is significant in the area of social history as the first building in the district originally designed and constructed to be an apartment building. The Lancaster City Historic District is significant in the areas of industry, commerce, government and architecture. The district reflects the development of Lancaster from eighteenth century through the first half of the twentieth century. The large concentration of mid-to-late nineteenth and early twentieth century industrial, commercial, and residential buildings presents the image of a small city created by the industrial and commercial boom of that period. The presence of a number of buildings constructed in popular eighteenth and early nineteenth century architectural styles illustrates the district's importance to the development of Lancaster County during the post-Revolutionary period, when the City of Lancaster was the largest inland town in the United States. The district illustrates the importance of the industry and commerce that fueled the development of cities in Pennsylvania. The architecture reflects the broad range of popular styles throughout the history of the city. With a high percentage of mid-late nineteenth century residential, commercial and industrial buildings, the district stands as an important collection of popular styles of that period. Census of Manufactures information from: Walker, Frances A. and Charles W. Seaton, Report on the Manufactures of the United States at the 10th Census (June 1, 1880), Volume 2, Government Printing Office, Washington, D.C.
Merriam, William, Census Reports, 12th Census of the United States, Taken in the Year 1900, Manufactures, Part II, States & Territories, United States Census Office, Washington, D.C., 7902,p. 756-787. Ideas about the importance of community planning to the development of the district are taken from; Schuyler, David, " The Evolution of Center City Lancaster." Unpublished manuscript. 1990. Information about history and significance of resources individually listed on the National Register taken from individual National Register of Historic Places nomination forms as listed in bibliography. Biographical Annals of Lancaster County. Sparten burg, S.C.: Reprint Publishers, 1989. City of Lancaster. A New Comprehensive Plan for the City of Lancaster. Lancaster, PA: Department of Housing and Community Development. 1993. Columbia University Urban Planning Program, Spring Studio 1992. Issues for Lancaster A Preface to the Comprehensive Plan. Columbia University. 1992. Ellis, Franklin, and Samuel Evans. History of Lancaster County, Pennsylvania, Volumes I & II. Philadelphia: Everts and Peck, 1883. Everts & Stewart. Atlas of Lancaster County Pennsylvania. 1875,reprint ed. Knightstown, IN: The Bookmark, 1976. Good, Daniel B. "The Localization of Tobacco Production in Lancaster County, Pennsylvania." In Pennsylvania History, 49 (1982): 190-200. Graves and Steinbarger. Atlas of Surveys of the County of Lancaster. Boston and Philadelphia: Graves and Steinbarger, 1899. Hammel Associates, Architects and Christopher Dawson, AIA. "W. W. Greist Building." Nomination to the National Register of Historic Places. 1997. Hartley, Eugene F.,7 4" Census of the U.S., Taken in 1920, Volume IX, Manufactures, Reports for States with Statistics for Principal Cities. Washington, D.C.: Government Printing Office, 1923. Historic Preservation Trust of Lancaster County. Our Present Past. Lancaster, PA: The Historic Preservation Trust of Lancaster County, 1985. ______ Lancaster County Architecture 1700-7850. Lancaster, PA: The Historic Preservation Trust of Lancaster County. 1992. Historic Preservation Trust of Lancaster County and Gloria 0.Becker, Ph-D."Tobacco Buildings in Lancaster City." multiple property nomination to the National Register of Historic Places, n.p., 1990. Historic Preservation Trust of Lancaster County and Jane E. Higenbotham. "Lancaster Historic District -2nd Annex." nomination to the National Register of Historic Places, n.p., 1984. Historic Preservation Trust of Lancaster County and Jane E. Higenbotham. "Hamilton Apartments." nomination to the National Register of Historic Places, n.p., 1984. Historic Preservation Trust of Lancaster County and Betsy Updike. "North Charlotte Street Historic District." nomination to the National Register of Historic Places, n.p., 1989. Historic Preservation Trust of Lancaster County and Betsy Updike. "North Prince Street Historic District." nomination to the National Register of Historic Places, n,p., 1989. Historic Preservation Trust of Lancaster County and David B. Schneider, "Conestoga cork Works Building." nomination to the National Register of Historic Places, n.p., 1996. Historic Preservation Trust of Lancaster County and David B. Schneider. "Lancaster City Historic District." determination of eligibility for nomination to the National Register of Historic Places, n.p., 1996. Historic Preservation Trust of Lancaster County and David B. Schneider. "Watt and Shand Department Store." nomination to the National Register of Historic Places, n.p., 1998. Historic Preservation Trust of Lancaster County and David B. Schneider. "William Montgomery House.'' nomination to the National Register of Historic Places, n.p,, 1999. Historic Preservation Trust of Lancaster County and John J, Snyder, Jr. "Reilly Brothers and Raub Building." nomination to the National Register of Historic Places, n.p., 1983. Historic Preservation Trust of Lancaster County and John J. Snyder, Jr. "New Era Building." nomination to the National Register of Historic Places, n-p., 1983. Historic Preservation Trust of Lancaster County and John J. Snyder, Jr. "Hager Building." nomination to the National Register of Historic Places, n.p., 1983. Historic Preservation Trust of Lancaster County and John J. Snyder, Jr. "Jasper Yeates House." nomination to the National Register of Historic Places, n.p., 1982. Historic Preservation Trust of Lancaster County and John J. Snyder, Jr. "Kirk Johnson Building." nomination to the National Register of Historic Places, n.p., 1983. Historic Preservation Trust of Lancaster County and John J. Snyder, Jr. "Lancaster Trust Company." nomination to the National Register of Historic Places, n.p., 1983. Historic Preservation Trust of Lancaster County and John J. Snyder, Jr. "Lancaster Crematorium." nomination to the National Register of Historic Places, n.p., 1982. Historic Preservation Trust of Lancaster County and John J. Snyder, Jr. "Lancaster Watch Company." nomination to the National Register of Historic Places, n.p., 1982. Historic Preservation Trust of Lancaster County and John J. Snyder, Jr. "Stevens High School," nomination to the National Register of Historic Places, n.p., 1983. Historic Preservation Trust of Lancaster County and John J. Snyder, Jr. "West Lawn." nomination to the National Register of Historic Places, n.p., 1983. Historic Preservation Trust of Lancaster County and John J. Snyder, Jr. "Henry Krauskop House and Store." nomination to the National Register of Historic Places, n.p., 1982. Historic Preservation Trust of Lancaster County and Mary T. Wiley, Jr. "Follmer, Clogg and Company Umbrella Factory." nomination to the National Register of Historic Places, n.p., 1986. Klein, H.M.J., Lancaster County, Pennsylvania: A History. 4 vols. New York: Lewis Historical Publishers, 1924. Lancaster City Planning Commission. . Lancaster's Heritage, Lancaster, PA: Lancaster County Planning Commission, 1972. Lancaster County Planning Commission and Robert M. Behling. "Lancaster County Courthouse." Nomination to the National Register of Historic Places, n.p., 1982. Landmark Review Project and Richard Greenwood. "Fulton Opera House," nomination to the National Register of Historic Places, n.p., 1974. Levengood Associates, Architects. "Sprenger Brewery." nomination to the National! Register of Historic Places. Loose, John Ward Wilson. The Heritage of Lancaster. Woodland Hills, CA; Windsor Publications,Inc, 1978. Merriam, William R., CensusReports Volume /I/, 12th Census of The United States, Part II,Taken in the Year 1900 States and Territories. Washington, D.C.:U.S. Census Office, 1902. North Museum/Franklin & Marshall College/PHMC and Sarah M. Jarvis/William K. Watson. " Original Buildings of Franklin and Marshall College." nomination to the National Register of Historic Places, n.p. 1975. Pennsylvania Historical and Museum Commission and Kristine Willson/Joseph Burke III. "Lancaster Armory." nomination to the National Register of Historic Places, n-p., 1990. Pennsylvania Historical and Museum Commission and Pennsylvania Register of Historic Sites and Landmarks. "Old City Hall." nomination to the National Register of Historic Places, n.p., 1972. Pennsylvania Historical and Museum Commission and Pennsylvania Register of Historic Sites and Landmarks. "Andrew Ellicott House." nomination to the National Register of Historic Places, n.p., 1971. Schneider, David B., ed., for The Historic Preservation Trust of Lancaster County. The Historic City of Lancaster.. Lancaster, PA: City of Lancaster Department of Housing and Urban Development. 1995. _______. Preserving Community Character, City of Lancaster. Pennsylvania,Lancaster, PA: Historic Preservation Trust of Lancaster County. 1992. ______ "The Evolution of Center City Lancaster." Unpublished manuscript. 1986. Scott, Joshua. Map of Lancaster County, Pennsylvania Lancaster, PA: Joshua Scott, 1824. Stacks, David C."Lancaster Historic District," nomination to the National Register of Historic Place's. 1978. Walker, Frances A. and Charles W. Seaton. Report on the Manufactures of the United States at the Tenth Census. Washington, D.C.: Government Printing Office, 1880.